A lantern procession which started Scotland's Homecoming celebrations generated significant visitor spending. 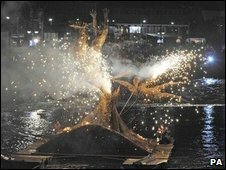 A report estimates the Burns Light event in Dumfries helped to bring about £150,000 into the local economy. About 17,000 people attended the celebration which started festivities to mark the 250th anniversary of the birth of Robert Burns. Organisers said it had been such a success they now hoped to stage a "closing event" on St Andrew's Day. A report to Dumfries and Galloway Council outlines the revenue generated by the procession. It estimates almost £100,000 was spent on overnight accommodation as a result of the event. A further £50,000 was put into the local economy by day visitors. "The statistics tell only part of the story," the report said. It added that a survey of people attending credited the event with creating a "community atmosphere" and "sense of belonging". Dumfries and Galloway Arts Association said funding bodies had been "pleasantly surprised" by the success of Burns Light. It is now considering bidding for support to stage a closing event for Homecoming on St Andrew's Day, 30 November. What is the appeal of Scottish identity?